Wheel of Chance Classic Slot Review - Casino Answers! 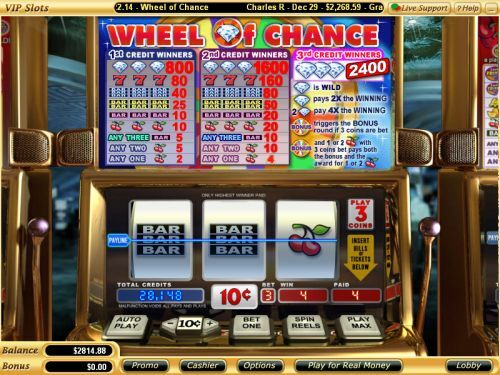 3-Reel Wheel of Chance is a 3-reel, 1-line classic slot machine developed by Vegas Technology, featuring a wild symbol, multipliers and a bonus game. You can play the 3-Reel Wheel of Chance classic slot machine at Bovada. 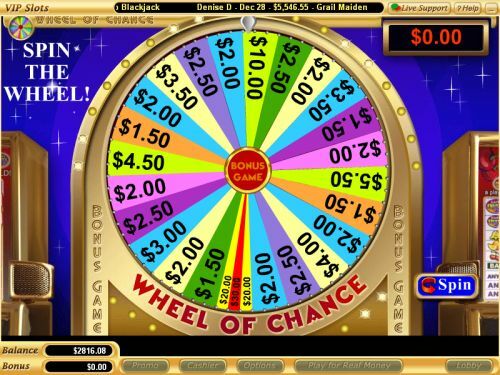 Coin values on the Wheel of Chance slot machine are $0.01, $0.05, $0.10, $0.25, $0.50 and every denomination of $1 up to $10. You can play 1-3 coins per spin on the Wheel of Chance classic slot game. Casino Answers recommends that you play the 3-coin maximum bet at all times to be eligible for the top jackpot and many of the features available on the Wheel of Chance online slot game. You can bet anywhere from a penny up to $30 per spin on the 3-Reel Wheel of Chance slot machine. Wheel of Chance has a good betting range, suitable for any online slots player. To play the Wheel of Chance classic slot, select your bet with the “Bet One” button and press the “Spin Reels” button. You can also use the “Play Max” button to play the maximum 3-coin bet on 3-Reel Wheel of Chance. The top paying symbol on the Wheel of Chance classic slot machine is the Diamond symbol. If 3 Diamond symbols land on the payline on a maximum bet spin, you will win the 2400 coin top jackpot. The Diamond symbol is wild and will substitute for all other symbols in the slot game, except for the bonus symbol (max bet spins only). Whenever the Diamond symbol substitutes in a winning combination, it will act as a 2X multiplier to double your winnings. Two symbols will quadruple your winnings. Use the Diamond symbol to earn huge winnings on the Wheel of Chance slot game at Bovada! There are 9 winning combinations on the Wheel of Chance classic slot machine. The complete payout schedule is as follows (1/2/3 coin payouts in parenthesis): 1 Cherry symbol (2/4/4), 2 Cherry symbols (5/10/10), any 3 Bar symbols (5/10/10), 3 Cherry symbols (10/20/20), 3 Single Bar symbols (10/20/20), 3 Double Bar symbols (25/50/50), 3 Triple Bar symbols (40/80/80), 3 Seven symbols (80/160/160) and 3 Diamond symbols (800/1600/2400). Hit “Autoplay” to open up the Wheel of Chance autoplay mode where you can select the number of spins (5, 10, 25, 50, 100, 250 or 500) and number of seconds between spins (1, 1.50 and 2). Stop settings include stop once all spins are complete, stop when jackpot is won, stop if a win exceeds or equals ($50, $100, $150, $200 or $250), stop on any win and stop if credits increase/decrease by ($50, $100, $150, $200 or $250). You can cancel autoplay on the Wheel of Chance online slot at any time by pressing the “Cancel Autoplay” button. The 3-Reel version of Wheel of Chance is an exceptional 3-reel adaptation of the 5-Reel version that you will also find at Vegas Tech casinos. The Wheel of Chance slot machine’s strengths are all on the maximum bet only, which includes the top jackpot, wild symbol, multipliers and the bonus game. Other than that, the payouts on playing three coins are the same as if you were playing two. You can play the 3-Reel Wheel of Chance slot game when you sign up and make a deposit today at Bovada! How much can I win on the 3-Reel Wheel of Chance slot machine? You can win $24,000 by hitting the top jackpot on a $30 total bet on the Wheel of Chance classic slot game at Bovada. Can players from the United States play the Wheel of Chance online slot machine for real money? Yes, players in the USA can play Wheel of Chance for real money at Bovada. For a list of more casinos where you can find Wheel of Chance, please read our list of Vegas Tech online casinos. Where can I read a review of the 5-reel version of Wheel of Chance? In addition to this review of the 3-reel version, you can also read our Wheel of Chance 5-Reel Video Slot Review.